The National Court Reporters Association (NCRA), the country’s leading organization representing stenographic captioners, court reporters, and legal videographers, announced that three major industry leaders serving or representing the court reporting and captioning professions have signed on to the Association’s corporate partnership program, NCRA said in a press release. NCRA welcomed MacCormac College, Chicago, Ill., Magna Legal Services, Philadelphia, Pa., And U.S. and Legal Support, Washington, D.C., as corporate partners. NCRA’s Corporate Partnership program, which ranges in levels of support from $10,000 to $100,000, aids in business and workforce development efforts by NCRA and the National Court Reporters Foundation (NCRF). The court reporting and captioning professions offer viable career choices that do not require a four-year college degree and yet offer good salaries, flexible schedules, and interesting venues. There is currently an increasing demand for more reporters and captioners to meet the growing number of employment opportunities available nationwide and abroad. 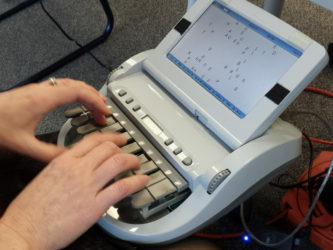 Court reporters and captioners rely on the latest in technology to use stenographic machines to capture the spoken word and translate it into written text in real time. These professionals work both in and out of the courtroom recording legal cases and depositions, providing live captioning of events, and assisting members of the deaf and hard-of-hearing communities with gaining access to information, entertainment, educational opportunities, and more.